Lisa Webber, a nurse at the University of California, San Francisco Medical Center, is credited with finding a meteorite fragment that has been confirmed to be a remnant of the fireball that streaked across Northern California skies last Wednesday evening. According to NBC News, Webber was at her Novato home on Wednesday when she heard a strange noise, but dismissed it as an animal on her roof. After reading an article about the meteorite's suspected trajectory, she did a search of her yard on Saturday, and found a 63-gram rock about 2 inches in diameter—when she held up a magnet to the mysterious object, it stuck. There was also a corresponding dent in her roof, right above where her husband -- a local Presbyterian pastor -- has his study. "It's wonderful. It's like the heavens coming down," Webber told SFGate. "And this thing probably came from an asteroid belt between Mars and Jupiter -- I mean, how cool is that?" Peter Jenniskens, a leading meteor hunter at the SETI Institute in Mountain View, confirmed the rock's origin. According to Jenniskens, the fragment is only the twentieth meteorite ever found with a known trajectory. "This is a little souvenir of our past," Jenniskens said at a press conference held outside Webbers' home, "A little photo album that tells us what happened at the time the solar system was born." But the search isn't over. Jenniskens told NBC News that there might be other, possibly larger fragments scattered along the meteorite's path, which ran from east of San Rafael, over west Novato, towards Sonoma. 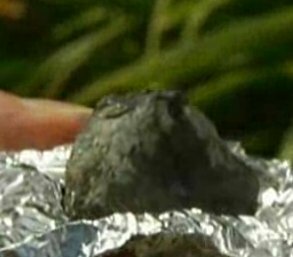 Earlier this year, a Sacramento-area woman found a 4 to 6 billion year-old meteorite in a local park where she was walking her dog. That exceptionally rare space rock was reportedly worth about $20,000, and is thought to have fallen to earth during a meteor shower April 22.